It may appear that Chinese medicine and feng shui aren't related, but both are part of the philosophy or, more aptly religion, of Taoism. This ancient system encompasses a vast set of principles by which ancient Chinese lived and millions still do today. Life is viewed very differently by the Chinese than the Western world. This view of life was translated into a complex but related system known as the Eight Branches of Tao. This system was designed as a way to understand the natural order of the world and how humans fit into the overall picture. The Tao or Dao (pronounced "Dow") means way or path. The Eight Branches of Tao is referred to as the Way of Life. All of these branches address the "three treasures" - heaven, humanity and earth. Unlike modern medicine that separates the body's systems and even organ functions and treat each separately, Chinese medicine treats the entire body systems as well as the influences of the cosmos and earth. Although Chinese medicine and feng shui are individual applications of the I Ching and the information contained in the Neijing, an ancient book on Chinese medicine, like all things Tao, they are used together. If you are undergoing Chinese acupuncture and herbal treatment, you want your home to reflect the balance these therapies are achieving. If your home doesn't have auspicious chi energy, then the imbalance within your body can easily return. Feng shui can be a preventative form of medicine if done correctly. Feng shui is the art of balance for the exterior and interior of your home. This plays a vital role to maintaining a healthy body. If an area in the home is afflicted with either a flying star(s) or an imbalance in energies, the body can also suffer. Feng shui is used as a preventative and remedy form of healing for your home, areas of your life, and even your physical body. Acupuncture Today sums it up, saying "Feng shui is a tool used to evaluate, remedy and promote influences that affect health, relationships and prosperity." The Chinese medicine applications used to make adjustments necessary to restore harmony within the physical body include acupuncture and herbal medicine. 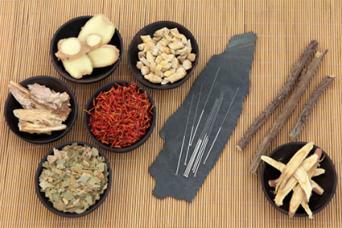 The most common forms of Chinese medicine are acupuncture and herbal medicines. Physical therapy is also included in a whole body approach to health. Three other forms used to facilitate reintegrating the mental, emotional, physical and spiritual bodies back into a balance of yin (female) and yang (male) energies include Taoist yoga, qigong (cultivation and balance of chi energy in the body) and Nei Dan (internal alchemy). The five elements are a basic centerpiece of the Taoism and all applications of the Eight Branches of Tao are based on these principles. The elements include water, wood, fire, earth and metal. In a productive cycle, each element feeds the next. When this cycle becomes imbalanced, the chi energy is disrupted. The cycle can become destructive. When needing to remedy too much of one element, the exhaustive cycle can be used to restore balance to the productive cycle. A feng shui practitioner works with your property first and then inside your home. The goal is to correct any issues with land and form, especially poison arrows bombarding your front door. A balance of the elements assigned to each compass direction must be restored so that the productive cycle can resume. Once the exterior of your home is corrected, the practitioner will analyze the interior of your home and make recommendations based not just on the objects of your home, but also the influence of the cosmological aspects, such as kua numbers of each member of the household, flying star locations, and the best directions for each family members for sleeping, eating, and working. All of these play a major role in all apects of individual lives, which also include health. Feng shui remedies can often correct a health problem a family member is suffering. For over 3,000 years Chinese acupuncture has been used to realign the chi in the body. There are many causes for the chi energy becoming blocked or interrupted. Injuries, emotional and physical are often the cause for dis-ease. The patient is treated as a whole and the doctor will evaluate the patient's five senses, appearance of tongue, eyes, stools, fingernails, and skin elasticity. There are many other physical attributes that the practitioner will examine. Often massage therapies are recommended, such as deep tissue massage (Tui Na), lymphatic drain massage, and cupping, to further move and release trapped energy. Using the five elements theory that all living things are composed of these elements, acupuncture can be used to identify and correct imbalances of these energies within the human body. Acupuncturists often refer to there being too much dampness (water) or too much heat (fire) in an organ(s) and various areas of the body. There can be blocked channels and chakras that the insertions of needles at specific energy points (meridians) within the body can reconnect those blocked circuits. Additionally, a Chinese doctor will prescribe herbs, herb combinations and various mix of teas that can also include tree barks to help restore a balance of the five elements in a patient. During the course of treatment, the herbs and teas will change as each issue is healed and the next one is tackled. Sometimes symptoms may be the result of several imbalances that take time and patience to restore. The Chinese approach to healthcare includes the patient in a very participatory manner with extensive explanations of the illness and treatments. The patient plays a very active role in the healing process and should apply feng shui remedies to ensure continued success.